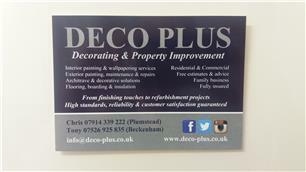 Deco Plus - Carpets/Flooring, Painter/Decorator based in Beckenham, Kent. Welcome to the Deco Plus Ltd profile. We established Deco Plus to pursue our passion and to work together to utilise our experience and knowledge to manage projects and jobs to help people with their decorating and property improvement needs. We are a family business run by brothers Chris and Tony. We have a wealth of experience and knowledge, and are available to offer advice and assistance. We pride ourselves on our professional service, reliability, dedication and customer satisfaction. We offer a comprehensive range of services in all aspects of interior and exterior painting and decorating, and property improvements. From the finishing touches to refurbishment projects we offer high standards, reliability to ensure customer satisfaction. We provide free estimates; impartial advice; professional high standards; reliability; and a courteous service.